Every blog needs a content strategy. That's a given. But with all the apps, planners, and spreadsheets available, the many options can be overwhelming. "Which planner is right for you?" NOTE: The questions in this post were asked by customers in the pre-purchase stage [via email]. If you have any further questions that I don't address here, don't hesitate to email me directly. And thanks so much for your interest in my products! Q1. What are the Blog Content Strategy Planners? There's also a weekly planner and the Content Planning Workshop, but they're not long-term content strategy planning tools. One is in printable, duplicatable (one time buy) PDF format: The #BlogStrategy Planner. The Content Strategy Planner is pre-printed on 20-pound (light weight) paper and bound at the spine. Q2. What are their similar features? Q3. What are their discerning features? Now, just because the #BlogStrategy Planner has 21 pages less than the Content Strategy, it doesn't mean I jipped you on content. The #BlogStrategy and Content Strategy Planners are quite similar. But, the former packs more (condensed) tracking and review pages. The Content Strategy Planner (CSP) is best suited for the "busy" content creator. You don't have time to worry about printing, and you only want to deal what you deem as important. BONUS: The CSP contains opportunity-based tracking, like a Guest Blogging Tracker whereas the #BlogStrategy Planner focuses more on analytics tracking. ADDED BONUS: Seeing that I geared the CSP to new[er] bloggers, I included a 9-email strategy and planner walkthrough available via email to all CSP buyers. #BlogStrategy's main discerning features are it's compact, detailed planning and tracking pages. NOTE: All interview participants answered the questions in this next section upon their own free will. Q4. Which planner is the most budget-friendly [over time]? The #BlogStrategy Planner is available in the Goff Creative store and comes as a PDF. The Second Edition lists for $18. The Content Strategy Planner is available on Amazon.com and comes pre-printed. The First Edition lists for $21. 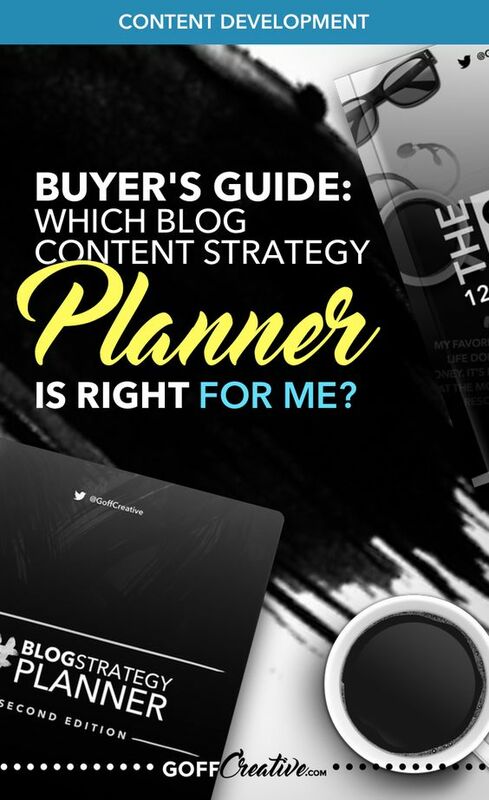 For a new[er] blogger, the Content Strategy Planner is a better buy. It come's pre-printed so there's less of a hassle dealing with printing, ink costs, etc. It includes full access to a free 9-email training featuring content strategy tips and suggested use for the planner. For a blogger who doesn't need or care for the foundational information for growth, the #BlogStrategy Planner is a smarter buy. In regard to long term budget-ability, the #BlogStrategy Planner wins. It's a one-time purchase that can be reprinted again and again. But, for someone without a good printing discount at your local office store, or without a quality home printer that can print front-to-back, the #Blog Strategy Planner will be a pain in the tush. 33% of the interviewed Content Strategy buyers said they preferred the convenience of "not worrying about printing" as the key reason for choosing the Content Strategy Planner over #BlogStrategy. 13% of interviewed participants said they would buy the #BlogStrategy Planner instead of the Content Strategy Planner "next time", while the remainder of Content Strategy Planner buyers said they'd continue to buy the CSP. I love the Content Strategy Planner! But I'm not a fan of the [spine] binding. I think next time I'll go with the [#BlogStrategy] planner because I can print it off myself and put it in a binder or something. Otherwise it's a fantastic planner and I would buy it again! Q5. Which planner offers the most control and flexibility? The #BlogStrategy Planner offers the most control and flexibility. With the ability to print and bind it in whatever way you choose, #BlogStrategy takes the gold here. Q6. Which planner will be better for a new blogger? With everything offered in the Content Strategy Kit, it's a great fit for newer bloggers. Q7. Which planner works best for a new-to-intermediate blogger? Both, but the #BlogStrategy Planner goes quite a bit deeper into metrics and tracking than the CSP. The #BlogStrategy Planner focuses on reviewing yourself and your business, monthly and quarterly—which is an important factor in long-term growth. #BlogStrategy also provides more refined tracking and documenting space that the Content Strategy Planner doesn't offer as thoroughly. Formerly, the #BlogStrategy Planner won, hands down, in popularity. I used the #BlogStrategy Planner over a year, so it's in many of my images and photos shared on Pinterest. (Plus, I'm sure being included in the "8 Time Management Tools" post (which has been shared over, now, 25,000 times) probably helps, too. But as of 2017, the Content Strategy Planner has surpassed the #BlogStrategy's sales by 5 to 1. Outside of it being a great planner, it's received lots of notice on Pinterest and Twitter recently. And since it's being purchased and reviewed more on Amazon, Amazon's algorithm is recommending it to more people searching for blog-related planners. So, as of this update, the Content Strategy Planner is now the most popular blogging strategy planner in the Goff Creative store. I've been creating planners for over 8 years now. It started as a hobby. I hated most all planners offered commercially, so I started making my own. When some industry friends (at the time) saw what I'd created, word got out and I started selling PDF copies of my planner to friends and friends of friends. But when a bigger demand for my custom creations surfaced, I decided to take it seriously. I wound up purchasing numerous PDF and pre-printed planners from multiple companies and entrepreneurs. All in search for a "hole in the market". So, I tried to find the "happy median" with my planners. Each planner has enough white space to satisfy the roaming pens. But, also, enough guidance to allow you to create smart, strong strategies for up to 12 months (and more) for your blog content. Also, I'm not some big company that crunches the numbers and follows the money. Okay, I do crunch numbers... But I do it with a different approach. My focus is on creating products and content you—as my customer—will use. Things and strategies that are easy to include in your day-to-day life. And, to top that off, I actually care what you think. The Second Editions of products in my store stem from what you have to say. So, today, pick the best planner to suit your needs. Go with the Content Strategy Planner if you're a newer blogger and you want more guidance. Or, simply because you don't want to worry about printing. Go with the #BlogStrategy Planner if you're a new-to-intermediate blogger. You're aware of what you want from your blog and business. Now you just need a focus-filled, distraction-beating tool to help you channel your strategy. If you're more interested in serious tracking and "balance review" prompts to make sure you're making progress each month, then the #BlogStrategy Planner is the best fit for you. Which blog content strategy planner is best for you? The Amazon-based 144-page paperback Content Strategy Planner guides you, step-by-step through 12 full months of content planning, strategy mapping and development. Includes a free 8-day email walkthrough to help you with the planning and development process. Thorough yet simple planning for your entire blog and email content strategy using this one-time-buy, 12-month printable planner. Ideal for new[er] to intermediate bloggers who are ready to focus on consistency, growth, and long-term strength-building for their content planning and strategy. If I didn't answer your question here, don't hesitate to contact me directly via email. I hope this post helped in your buying decision. And I'm so looking forward to having you as a customer!